My name is Rene Berry. I absolutely love all things fashion and consider myself a diehard menswear enthusiast! I've followed fashion since I was younger. My father, a major influence on my style of dressing, used to take me shopping with him, schooling me on the best menswear. I even kept scrap books of my favorite styles from magazines like Vogue, Elle, Glamour, Seventeen and yes, GQ. Now, I've replaced scrapbooking with blogging, Instagramming, and pinning on Pinterest. For Fall 2015, Menswear is trending very strongly. Banana Republic has included oxfords, ties, blazers, fedoras, and newsboy caps in their styling. Nine West, one of my favorite shoe brands, is featuring a line of two tone oxfords that I can't wait to get my hands on. 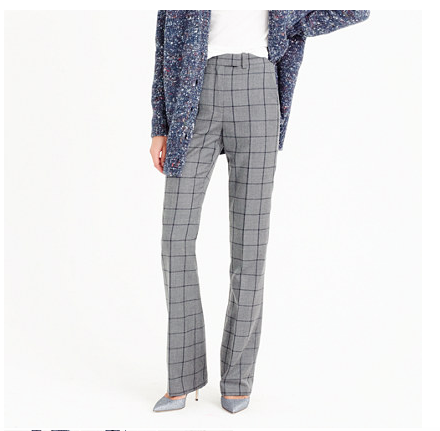 And my favorite store of all time, J.Crew, known for masculine styling, has stepped up their game by adding windowpane print trousers (Photo above.) to their collection this season - I'm in heaven! Despite being a trend this season, (I say) women sporting menswear is here to stay! From the greats like Marlene Dietrich to today's Sarah Ann Murray, women in menswear, at times, pull it off better than men. Wink. And a woman in a suit (See photos above.) will always stand out in a crowd. The Rene Berry in her signature menswear look. Rene is an influencer with a may-jor following on Instagram - look for her on IG @thereneberry. Also, find her fashion blog (and more insights about her upbeat, classic with a twist style) at thereneberry.wordpress.com. Photo Credits: All photos courtesy of Rene Berry, except for Banana Republic vest and J.Crew windowpane trousers - Both are courtesy of their respective sites. All celeb in menswear photos are courtesy of Pinterest.